My first novel in several years is out this week – Like Hybrids it's still YA, it's still set in the future, but it's very different in subject matter. I thought it might be interesting to talk about why I wanted to write it. 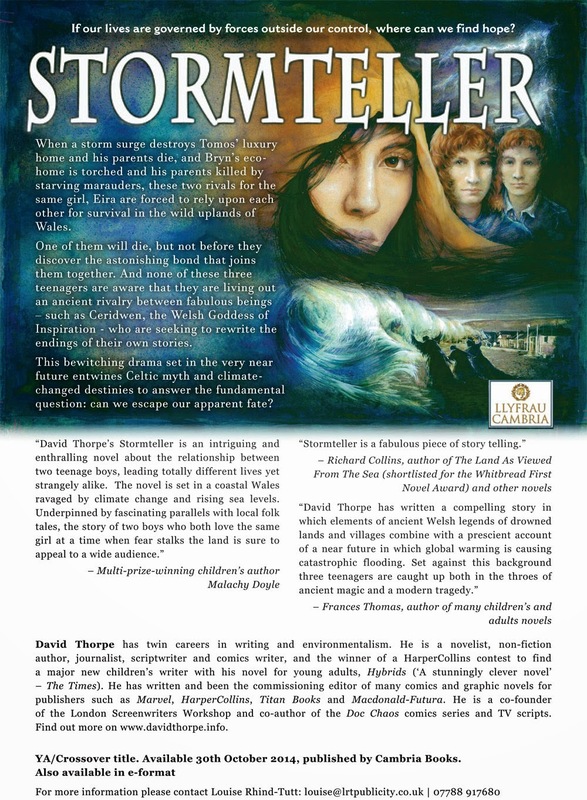 I lived in mid-Wales, where Stormteller is set, for nearly 20 years. After separating from my first wife I eventually landed up in Taliesin, partly because I was attracted to a place named after Wales' legendary bard. I know the landscape almost as well as I know my back garden now, having walked over much of it. I always felt when I moved to this edge of the British Isles from London that here, unlike most places, the skin of the present is thin: you can feel the vibrations from the past still reverberating down the centuries like thunder beneath your feet. Just inland from Taliesin village is a collapsed dolmen that is given the name 'Taliesin's grave' – though it is much older than that. 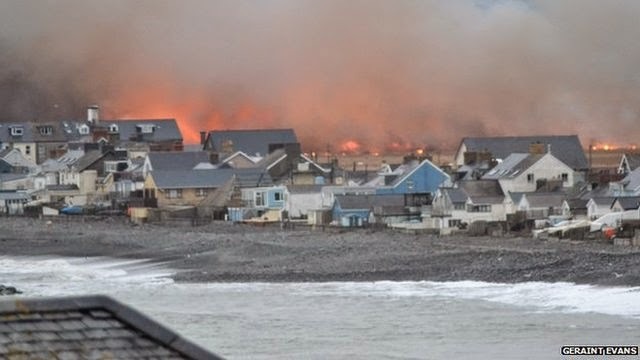 Between my house at that time and the sea, lies Borth bog: you may remember the images in the media last winter when flames were leaping across it from burning peat despite the snow: spooky. And then Borth itself: a long sliver of a town that shouldn't be there, streamed onto a spur of land against the glint of the sea, on a section of coast that is the most vulnerable in the whole of Wales to storm surges. Again, it was in the media last winter when it was attacked by giant waves. 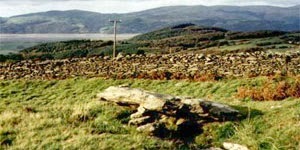 The spur continues to Ynys Las, a nature reserve of sand dunes opposite the Dyfi estuary from Aberdyfi – a colony of English retirees and yachting people largely immune to the influence of the past. Above it, however, by the Bearded Lake, is allegedly a footprint left by King Arthur when he passed this way, and north of there the mountain Cader Idris, Welsh for Seat of Arthur. But the real stories that come from this area are older than Arthur's: the birth of Taliesin and Cantr'er Gwaelod, which is the tale of how the land that now lies beneath Cardigan Bay was drowned by the sea. It's these, and the beautiful, wild and dramatic landscape, that sparked my imagination to write this novel. Let me tell you the beginning of the first story: a mother had two children – a beautiful girl and a hideous boy with a hunched back. The girl wasn't a problem, she's not even part of the story, probably got married off to a Prince. But the boy... the mother felt sorry for him. Perhaps the gift of wit and wisdom might make him popular so she could get him off her hands. So she laboured a year and a day to make a magic potion for him, but on the last day she left the servant boy, Gwion, in charge while she popped out. "Just stir: don't taste," she told him. You can probably guess what happened next. The long and the short of it is that Gwion got to sample the potion and he received all the gifts intended for the son. He was the one who became Taliesin. Nowadays, Taliesin is revered in Wales and beyond for his poetic and shamanic genius. But his talents should have belonged to someone else – the son, whose name is Afagddu. No one remembers him now, but Taliesin has a village and even an arts centre named after him. So I thought: how would Afagddu feel? What would he want? And this is a starting point for Stormteller. 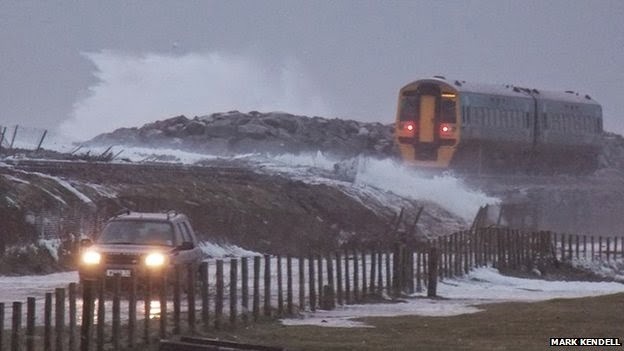 ...with a tragic ending – the flooding of the land – that it seemed to me has echoes of the threat that Borth and the whole coast of Britain faces now and in the future: rising sea levels, more storms and extreme weather caused by climate change. We all feel threatened by climate change. We feel powerless to do anything about it. So I wanted the novel partly to be about giving some degree of optimism. It's trying to look at the question of rewriting the endings of stories: ours – about climate change – and these two old legends. You can find out more about the background to the novel here. This sounds fascinating. The Bearded Lake and Cader Idris are Susan Cooper territory too, aren't they? This will go on my to-read list! Thanks, Sue - exactly so, the events described do overlap slightly in space but not in time! There's a story about how the novel received a grant to help me write it with a condition that I set part of it in a particular place and then write about the locations for the sake of tourism! But I would have done that anyway! What a fascinating post David! And a lovely title... Stormtellers. Those photographs give me the shivers they are so atmospheric! Almost dystopic! Loved this... 'unlike most places, the skin of the present is thin: you can feel the vibrations from the past still reverberating down the centuries like thunder beneath your feet.' I feel that in certain parts of Africa. Sounds as if it's a marvellous book. I've read it, Dianne. It is. Thank you Dianne and Malachy for the kind words. It's funny you say that the pictures are almost dystopic, when they are real! I very much enjoyed your post, David, and look forward to reading the book too. I spent several years in Aberystwyth studying, so I know the landscape around Borth well! The photographs are so atmospheric. I have a hankering to go back and visit now! Good luck with the book. Can't wait to read it! And I should add of course Malachy used to live in the area, for a while in Aberdyfi itself. His own success in writing the children has been an inspiration to me. He was very kind and giving me good advice during the writing of the book. I'm going back to Borth at the end of this month to give a little talk about the book. Lovely post - I went to school in the shadow of Cader Idris and my parents now live in Aberystwyth. I know what you mean about the magic of that landscape. Cader Idris broods over the surrounding lowland and lakes. The book sounds great! I'm a frequent visitor to Borth - a wonderfully atmospheric location - and I look forward to reading the book! By the way, do you know Nancy Bond's A String in the Harp, another Borth-based Taliesin tale (though almost 40 years old now)?